In this last presentation, I want to sum up what we have looked at before and focus in on a step by step tour of our celebration of the Mass. To do this, I plan to begin by presenting a very broad picture, drawing on some things we’ve already covered, but also bringing in some new perspectives or tools with which we can consider the Mass, and better understand our role in it, as participants and as ministers. Please note that I always include myself, and the role of the ordained priest-presider, when I speak of participants and ministers. I do not exist separate from you, or somehow hovering above you in a position of remote and unreachable holiness and authority. God forbid. Our Catholic-Christian tradition affirms that the priest is first of all one with his people. St. Augustine said: “With you I am a Christian; for you, I am a priest.” Without you, I am nothing — I have no reason to exist as a priest. In fact, without you, Jesus Christ is nothing. Without you, he might just as well as stayed home! That’s an awesome thought, isn’t it? If you’re listening carefully, I hope you can see that everything I’m saying has to do with relationship — how individuals within the community of the Body of Christ relate to one another, including Christ himself — and the notion of relationship therefore is at the heart of what we do and why and how we do it. Our celebration of the Eucharist is fundamentally a dialogue between our human selves and God, which takes place in its fullness in Jesus Christ himself, because he embodies in himself the two parts of that dialogue. What does “dialogue” mean? It comes from the Greek prefix “dia-” meaning “across,” and the root “logos” meaning “word.” However, the meaning of “logos” embraces much more than a word in a spoken sense or a dictionary sense. In Greek, “logos” means the thought or idea that is communicated. But your thoughts and your ideas cannot be separated from yourself, can they? Ideas do not exist like a disembodied cartoon light bulb hovering in a balloon over your head. In a very real way, your thought or idea is a vehicle which ultimately contains yourself or at least something of yourself. Remember what we said about symbolic communication, and how an underlying reality is in some way contained in the outward sign — a deeper inner reality (a something) encased and communicated in a perceptible outward reality (a something else). A true dialogue is, therefore, a bridge — a symbolic bridge to be sure, but nonetheless a very real bridge — uniting persons who would otherwise be isolated and unconnected. The word dialogue is pretty much synonymous with conversation. In its Latin origins conversation means a turning of persons toward one another, and is closely related to the word “conversion.” Neither conversion nor conversation can be a solo act! A true dialogue or conversation involves both genuine giving of oneself to the other and at the same time receiving the other into oneself. This is true of our relationships to one another, and of our relatoinship with God. It’s clear from the witness of Scripture, especially the New Testament — see for example, the Letters of John — that you cannot separate the two relationships. But, this giving and receiving, even in the case of the infinite God, will always be finite, imperfect and partial because of the limitations of the human condition on our part of the dialogue. As I’ve indicated before, the Church understands and teaches four modes of Christ’s real presence in the Eucharist — in the assembly that gathers, in the persons and actions of the ministers, in his word, and in the sacrificial meal of transformed bread and wine, truly the substance of his body and blood, but localized and perceptible only through the unchanged physicality of the bread and wine. We’ve noted that these four modes of Christ’s presence are the primary symbolic elements that make up the sacramental sign of the Eucharist. In relation to them, everything else is secondary because everything else serves to support or express the primary symbol in some way. As we look at the parts of the Mass and how they relate to one another, I am going pay particular attention to identifying how the parts of the dialogue unfold and interact and how the primary and secondary elements relate to one another. This will help us to build some general guidelines for our preparation and participation, as well as the performance of our ministries. To conclude this segment, however, I would like to say something about music. I have already noted that music is a secondary symbolic element, one that exists to serve the primary symbolic elements that make up the sacramental sign. It is nonetheless vitally important. In fact, liturgical documents, even before Vatican II, are strong in affirming that music is integral to the celebration, and a Mass without appropriate music is something less than it should be. The rub, of course, is determining and agreeing on what is “appropriate” music, and this will remain a source of differing opinions and even conflict among liturgical musicians and almost everyone else until Jesus comes again in glory. I venture into dangerous waters here, but am speaking from both professional formation in the science and art of liturgy as well as nearly 45 years of pastoral experience as a priest. First of all, I am not going to address issues of style or taste. Strong feelings about this abound, but we also have to recognize that the church throughout the ages has been open to a variety of artistic styles in its ritual, even drawing on sources that are sometimes viewed as irredeemably secular. The meaning of the incarnation is that the sacred infuses the secular: the secular can be a vehicle for the sacred. But we have to be careful — and honest — that the secular doesn’t deny, ignore, overshadow or squeeze out the sacred. We can find God in all things, but we have really be searching for God, and not use God as an excuse to fulfilll and even glorify our own desires and tastes. Sung texts also serve to unify the voice of the assembly. When we sing a text, even with a simple one-note tone, for example, we tend to stay together as one voice. When we recite the same text, we are often all over the place, some faster, some slower, some louder, and so on. The result is too often a jumbled cacophony rather than a unified prayer. Sometimes music serves to accompany an action, such as a procession or the preparation of the offerings or the breaking of the bread. Other times music simply serves to create or accompany a prayerful atmosphere, and may even serve as an enhancement of silence. In these cases the nature of the particular moment and movement governs the choice and style of the music. The underlying question has to be, How does the music serve the presence of Christ in the assembly? There are many ways of answering that question in planning and implementation, but the question itself has to be the overall guiding principle. There are two particular moments of the Mass that by their very nature call for singing rather than reciting on the part of the assembly. These are the acclamations: the “Alleluia” before the Gospel (which is replaced by a synonymous phrase during Lent) and the three acclamations during the Eucharistic Prayer: “Holy, holy, holy…”, the Memorial Acclamation after the “Mystery of Faith,” and the “Great Amen” which embodies the full assent of the assembly to the Eucharistic Prayer. Depending on the solemnity of occasion, however, almost every part of the Mass can be sung, including the proclamation of the Gospel and the other Scripture readings. The Tridentine Mass made a distinction between “Low Mass,” “High Mass,” and “Solemn High Mass,” with a prescribed ritual for each. The Vatican II reformed missal goes back to a more ancient concept of “progressive solemnity” in which various ritual elements, including music, can be included or enhanced according to the solemnity of the occasion and the abilities of the participants. That means, yes, a lot is up to us. And that’s why parish liturgy planning requires a variety of participants from various ministries, backgrounds, and experiences engaged in the details of preparation, respectfully listening to and speaking to one another. The most recent revised translation of the Roman Missal incorporates a lot of sung texts for the presider. You notice that I do not sing any of them. Never have, and I’m not going to start now. I think there is also an important principle involved here. Good silence is always better than bad speaking; good speaking is always better than bad singing. I put a lot of effort into proclaiming my parts of the Mass well, in a way that not only communicates effectively, but also, I hope, engages you, the members of the assembly, in active listening as your way of participating at that moment. Even if I got the notes right, I know that my attempt to sing those texts would ccall attention to itself in a way that would reduce rather than increase the quality of communication. The presence of Christ in the assembly would not be served. After our break, we’ll begin looking in more depth at the various parts of the Mass. The next vestment is the stole, a long band of cloth in the liturgical color, which, worn around the neck, signifies the ministry of the priest, or, over the shoulder, the ministry of the deacon. This is worn not only at Mass, but whenever the priest or deacon is exercising some official liturgical function, such as the celebration of other sacraments. Finally, the chasuble, which comes fro the Latin casula, meaning “little house.” It was simply an outer garment, like a “poncho,” from ancient times. Like most liturgical vesture, the chasuble was simply an ordinary piece of clothing that remained in ritual use long after styles changed. Another point I’d like to address in this overview is the question of to whom are we speaking at Mass? Not only do liturgical ministers have to speak in a way that the members of the assembly can hear, understand, and be engaged in, they also have be aware of to whom are they speaking, especially the prayers. Think about it a minute: to whom are we praying at Mass? Well, with only one exception, all of the publicly spoken prayers of the Mass are addressed solely to God the Father. Liturgical prayer is Trinitarian not in that we address God — Father, Son, and Holy Spirit — in the same breath as the object of our prayer. We do not pray to the Trinity like a remote God, “out there.” Our faith in God as Trinity is that God invites us into the inner life of the relationships of persons in the Trinity. We pray, therefore, from within the inner life of God, from the inside, not the outside. Therefore, all our liturgical prayer, culminating the Eucharistic Prayer itself, is directed to God the Father, in and through Christ, in union with and in the power of the Holy Spirit. Listen carefully to the prayers of the Mass and you’ll see what I mean. In fact, if you listen carefully to the prayers of the Mass — something you can do better if you study them beforehand in a Missal or preparation booklet — you can’t help but be drawn into them. 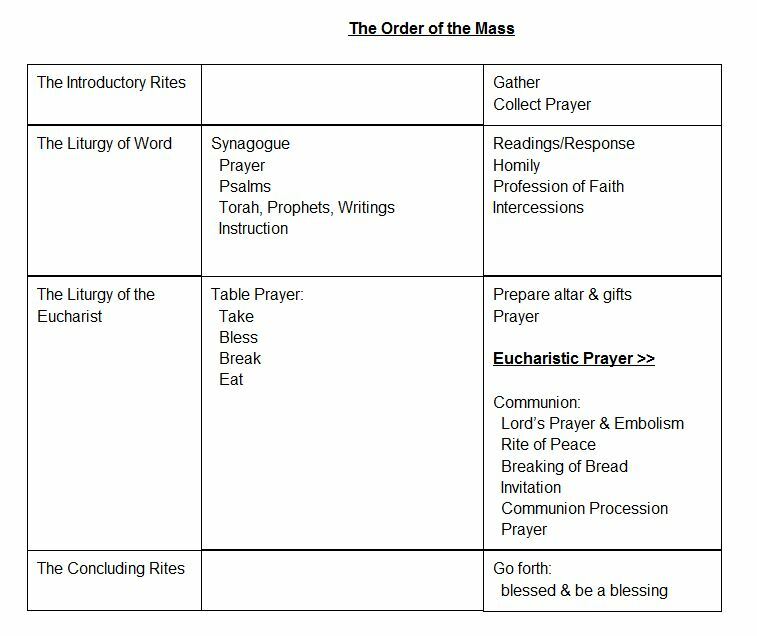 Let’s look now at the overall structure of the Mass in the chart on the next page. Notice that I haven’t included all the details in this chart because I want to highlight the important elements of structure. As we know, there are two basic parts to the Mass, the LIturgy of the Word and the Liturgy of the Eucharist. These two parts of the Mass have their ritual origins in the Jewish rituals of the synagogue gathering on the sabbath, and the blessing and partaking of the family meal in a Jewish household. Note that this ritual was true for ordinary meal-time blessings, not just for Passover. The Introductory Rites and the Concluding Rites serve only to enable the assembly to gather and prepare for the Word and the Eucharist, and to go forth. The sole purpose of the Introductory Rites is to prepare the gathered assembly to hear and respond to the Word and celebrate the Eucharist. It serves as a kind of buffer zone from our normal activities. This is why there is an element of purification in the Penitential Act as well as an element of praise in the “Glory to God.” It begins with a sign of the cross and greeting, “The Lord be with you,” and concludes with the Collect, the spoken prayer by the priest which serves to collect together the prayer of all of us as we begin our celebration. A brief note here about the sign of the cross and greeting. Pay attention to the fact that there are only four times during the Mass when the presider greets the assembly, and only four times that the sign of the cross is used. And each of these marks a significant moment in the structure of the Mass. Of course the Mass begins with the presider leading the assembly in making the sign of the cross, and says the greeting. And in the concluding rites, preceding the dismissal, the presider says the greeting, and blesses the assembly with the sign of the cross. The same greeting is also at the beginning of the Gospel, and everyone makes a sign of the cross on forehead, lips and breast. The is a sign of the importance of Gospel at the heart of the Liturgy of the Word. The dialogue which introduces the Eucharistic Prayer begins with the greeting, “The Lord be with you,” and the sign of the cross is made over the gifts of bread and wine at the epiclesis of the prayer, when we ask the Father to send the Holy Spirit to transform them into the body and blood of Christ. Notice this when you come to Mass. These are the only four times the greeting and sign of the cross are called for in the order of Mass, and they clearly emphasize the importance of what’s happening at that moment, or soon to come. Some people and even priests add more signs of the cross out of personal devotion or perhaps habit. But they shouldn’t. We have already discussed the Liturgy of the Word when we spoke in previous sessions about the presence of Christ in the Word and in the ministers, So I’d like to focus on the Liturgy of the Eucharist. Preparation of the Offerings is simply that — nothing more, nothing less. There is sometimes a kind of mystique surrounding the bread and wine for the Eucharist, for example, in the special shape of the unleavened wafer. The law if the Church does require unleavened bread, and that it be made solely from wheat flour and water. This does require some special baking techniques ,which is why convents have usually specialized in making altar breads, often as part of their own fund-raising and support. Having been part of several groups who have tried to promote parishioners’ baking altar bread in their own homes and parishes, I can testify that it’s a difficult procedures and often produces results that are not very good. We’ll stick to the nuns’ for supplying them. One little note, however, there is a convent in the midwest that has discovered a way to make virtually gluten-free altar breads that fulfill both the church requirements and are medically determined as safe for people with celiac disease. We make them available here at Good Shepherd for anyone who may need them. Any good wine produced using accepted wine-making techniques is acceptable as altar wine. In fact, the laws of the State of California regarding purity and additives are even stricter than the laws of the church. Once the offerings of bread and wine have been properly placed on the altar, the rite concludes with another prayer in the “collect” style, with an invitation to pray, a spoken response by the assembly, and a concluding prayer by the priest. There should be a definite pause after this prayer before the greeting and dialogue that begins the Eucharistic Prayer to emphasize that a new and central part of the Mass is beginning. The Eucharistic Prayer begins with a dialogue, which sets the stage. The word “eucharist” means “thanksgiving,” and the prayer for consecration takes place firmly rooted in the context of thanks and praise. The structure of the Eucharistic Prayer derives from the Jewish table blessing, in which we first thank God for the gifts of the past, and then pray that God will bring the blessings of the past into the present. The word “anamnesis,” in Greek, literally, “unforgetting” or remembrance, is the first movement of the prayer. We thank God for the gifts of creation and redemption, especially the presence and work of Jesus Christ. “Anamnesis” moves to “epiclesis,” which means in Greek “calling down upon,” the twofold prayer in which we call upon God the Father, through his Son, to send the Holy Spirit to transform the gifts of bread and wine into the body and blood of Christ, so that, through our reception of these consecrated gifts, we might become what we receive. If you listen carefully, you can perceive both the prayers for transformation — the gifts and us — in the Eucharistic Prayer. In the text, they are separated by narrating the event of the Last Supper, and the words by which Jesus gave us the Eucharist. Note that, in the context of the prayer, these words are being told to God the Father, in remembrance of what God did through Jesus back then, and seeking the continuation of that saving event here and now. The “epiclesis” of the Eucharist Prayer continues with intercessions in which we pray in union with Mary and all the saints for the church throughout the world. And the prayer concludes with the great “doxology” or declaration of praise to God the Father, through, with, and in Christ, in the unity of the Holy Spirit. And the assembly concludes with the “Great Amen,” which should always great and resounding. If the Eucharistic Prayer is properly done, there is need for a moment to pause and catch our breath before launching into the Communion Rite. The Lord’s Prayer and it’s embolism and doxology begin the preparation. Embolism just means an “add-on” and it’s kind of a riff on the last phrase of the Lord’s Prayer. The doxology (“For the kingdom, the power, etc.”) is familiar to us as the ending that Protestants often add to the Our Father. To many people’s surprise, it’s not found in the Gospel, but there is evidence it was used in the liturgy since the end of the first century. Then we pray for peace and offer each other the sign of peace, a rite from the most ancient days which was restored by Vatican II. The sign of peace is placed precisely here to be sure our attention is focused on Communion as a communal action, not an individual act of reception. We are compelled to turn toward each other and recognize one another as fellow members of the Body of Christ as an important part of our preparation to share together in Communion. From earliest days also, the Eucharist was called the Breaking of the Bread — days long before the invention of neat little pre-cut hosts — so the large altar bread is broken at this time. Recalling the ancient practice, the church directs that the principal “large host” at Mass should be large enough that pieces of it can be distributed to the faithful in Communion. The breaking of the bread should be done in a way that is clearly visible to the assembly, and it should be evident that pieces of it are used for distribution. The Lamb of God is sung at this time to accompany the breaking of the bread. Then, after a brief silent preparation of the priest, he holds up the consecrated bread and wine and invites people to partake in the “Supper of the Lamb,” using the beautiful expression from the Book of Revelation. In the Communion of the Faithful, we need to remember that Communion is not primarily an individual act. It is members of the Body of Christ together being nourished by the sacrificed Body and Blood of Christ. Extraordinary Ministers of Holy Communion are not just dispensing the host or cup. They are embodying their own relationship with their fellow members of the Body of Christ, and therefore words and actions need to embody reverence for the people receiving as well as the consecrated bread and wine. A part of that reverence is attentiveness — to be sure that all the communion stations are filled, even if perhaps it’s not what you were assigned, and to be sure that the disabled are not forgotten, as, unfortunately happens too often. The disabled, actually, should receive first. The presider will often place broken pieces of the large host in the other ciboria. Ministers of Communion should be sure to distribute them. They are an important part of carrying the symbolism of “one bread, broken”, and should be distributed, not be left in the ciborium. After Communion, the ministers should be ready to do what’s needed to take the ciboria and chalices to the side table, place the remaining hosts in the tabernacle, and clear off the altar as needed. “As needed” are the important words here. Don’t just stand there or return to your place when some things remain to be done. There should be a few moments at least for quiet reflection after all is in order, and then all stand for the Prayer after Communion, which formally concludes the Communion rite. Neither announcements nor a “second collection” should ever take place before the Prayer after Communion. Announcements, brief and well-crafted for effective communication, are an integral part of connecting the Eucharist with the rest of our life as a Catholic Christian community. They should be seen as an invitation to engage in the various aspects of our parish life. Therefore they should not contain extraneous, impossible to remember information, nor should the same thing be repeated week after week. Well planned and well crafted are the important words.